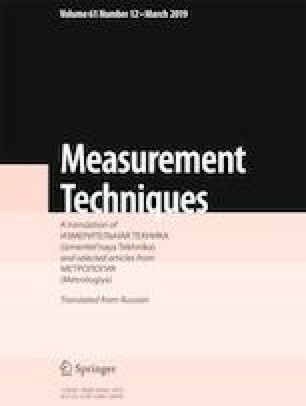 The measurement function is calculated for the modulus of the vibration acceleration vector of three-component vibration transducers by means of a unicomponent calibrating vibration shaker. Two options for defining the measurement function of the modulus of a vector are analyzed: calibrations against one- and three-component reference vibration transducers. Formulas for finding the measurement function of the modulus of the vibration acceleration vector and calculating errors are given. Experimental results that confirmed the theoretical studies are provided. Translated from Izmeritel’naya Tekhnika, No. 12, pp. 38–42, December, 2018.